I'm a bit late in getting to this, but I have to disagree with Suzy Khimm's take on GOP Senator Tom Coburn's co-authoring a piece for The Advocate with Christopher Barron, Chairman of GOProud. That organization was founded earlier this year (I wrote about it here) by a pair of disgruntled former employees of the Log Cabin Republicans, who argued that the flagship gay GOP organization had been hijacked by liberals. GOProud is trumpeting the op-ed as a major victory, and as a symbol of the influence that they are slowly earning with conservatives on the Hill. The specifics of the Ryan White CARE Act (the subject of the op-ed and which Coburn and Barron criticized as illustrative of the problems with the various Democratic health care proposals) aside, Suzy finds it "difficult to take seriously" the pair's arguments because Coburn "has a long history of vicious attacks on gay rights." I disagree. 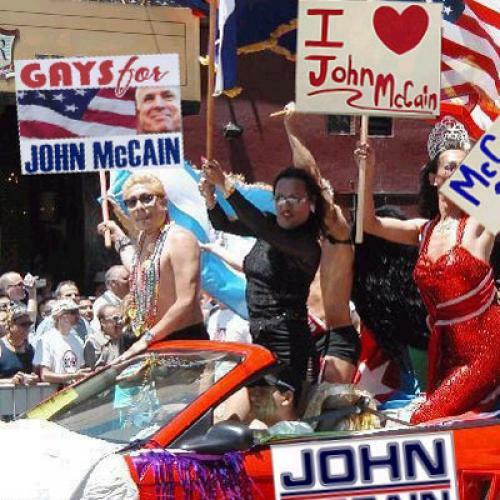 That Coburn isn't likely to be Grand Marshall of a gay pride parade any time soon is not in doubt, and Suzy provides a long list of unseemly statements that have emanated from the Senator (she missed, however, one of his more shocking revelations, made during his 2004 Senate election: that "lesbianism" is so "rampant" in some southeast Oklahoma schools that teachers will only allow one girl to enter the bathroom at a time. Who knew that lesbianism, and not the mythical sort fantasized about by heterosexual men, was so exciting?). But she's missing the bigger picture. If you told a gay political activist last week that Tom Coburn would coauthor an article with the Chairman of an organization that, while conservative, is explicit in its promotion of the dread "gay agenda," they'd look at you pretty queerly. But here is Coburn doing exactly that, and in the digital pages of the country's leading gay news magazine no less (full disclosure: I am a contributing writer to the Advocate). When I first reported on GOProud back in April, some of the disgruntled Log Cabinites I spoke to warned that enemies of gay rights would use the organization as a convenient cover for their anti-gay political agenda. Liberals are making just that point about the Advocate piece, with the Washington Monthly's Steve Benen arguing that Coburn is "arguably the single most anti-LGBT lawmaker in Congress." Yet if there is to be progress in this country on gay rights, Republicans, and conservative ones especially, are going to have to be a part of it. This is something that GOProud understands, and while I was initially skeptical of the group, I've come around to thinking that they serve an important function: talking to conservatives on respectful terms and making them see that an appreciable number of gay people share many of their values. If the President of the United States can "engage" with all manner of tyrants and petty thugs, then surely a small group of enterprising homocons can co-sign an op-ed with a conservative Senator from Oklahoma who, not so long ago, was railing against the "gay agenda." What Coburn may or may not realize is that he's just become an unwitting cog in it.